As the Pastor of High Peak Baptist Church since January 2007 I have the privilege of being Christ’s under-shepherd for a great congregation. High Peak’s strengths are a passion for the Word of God, a love for one another, and a dedication to seeing people become growing followers of Jesus. I became a pastor in 1993 at Blanket Creek Baptist Church in Falmouth, KY. Since then I’ve served two other church in Rose Hill, NC and Dallas, NC. I graduated from Georgetown College, in Georgetown, Kentucky in 1991 with a major in Religion and one in Philosophy. I attended Southern Baptist Theological Seminary for a couple of years while in Kentucky and then finished at Southeastern Baptist Theological Seminary in 1998. After a few years I decided to return to improve myself by attending Gordon Conwell Theological Seminary working on a Doctor of Ministry in Preaching. You can read my dissertation on my personal website. In addition to serving as a pastor I have a writing ministry. I write a monthly column about Bible Study Software for Christian Computing Magazine. I’ve also published articles in other publications and online technology websites. If you come worship with us, you can expect a very comfortable atmosphere. I try to preach Biblically based sermons using the Holman Christian Standard Bible primarily. I enjoy using visual illustrations and consider my messages Biblical expository sermons. I preach for about 30 minutes, sometimes shorter and other times longer. My favorite teaching time of the week happens on Wednesday at 7:00 PM in our Fellowship Hall! We do in depth inspiring studies to challenge and focus you during the middle of the week. Come Sunday night at 6:00 PM for a very casual time. We pray and sing and then I preach or teach for the remainder of the hour and we almost always get out by 7:00 PM. My wife teaches third grade at Valdese Elementary School. I have two boys, Michael and Daniel who play sports, love art and enjoy video games. What teenage boy doesn’t! 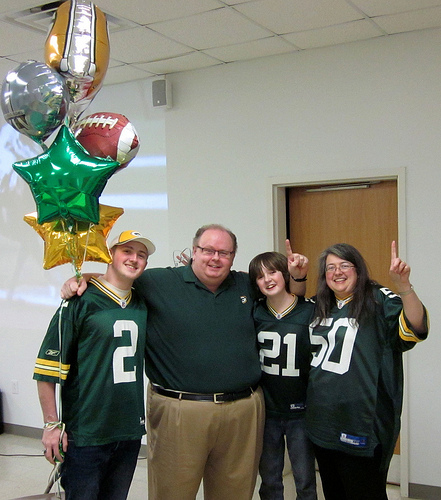 My family after our beloved Packers won the Super Bowl in 2011. Here’s a 3D spherical view of my office where I study and spend time counseling when needed.